The Venus Bench was only named in 2014 by the British retailer The John Lewis Partnership when they re-launched the Bench and accompanying Chair GE1936 on the occasion of their 150th anniversary. These classic designs had been out of production for over six decades since they had last been manufactured by the Danish company Fritz Hansen. 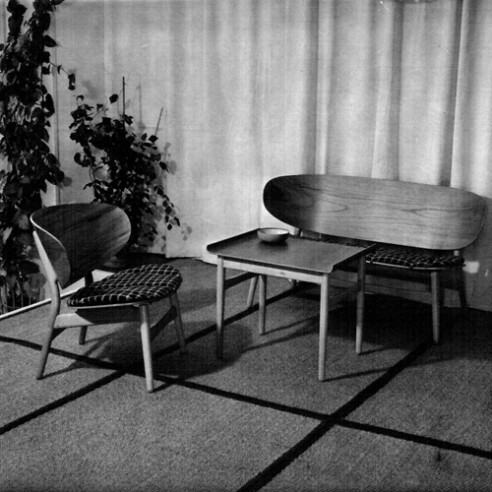 The chair though not the first of Wegner’s experiments using the then new industrial technique of laminated wood it was the first to be put into production and represents a milestone in Danish furniture design. Laminating is possible because wood is flexible and thin pieces are easily bent. It is the technique of slicing up wood into thin pieces and gluing them together to form a new shape. WWII for the aircraft industry. In the 1940’s and 50’s Ray & Charles Eames were at the fore in developing some highly innovative and iconic designs exploring the potential of this technique. Wegner proposed a laminated shell chair as his entry for the competition for a low cost furniture at MOMA in New York and the Venus chair and bench is the result of his early experiments using plywood shells bent in two directions. The chairs are a combination of traditional cabinet making for the supporting frame in solid wood with the laminated seat and large curved back cantilevered so as to appear to float in mid air. Wegner took the step of removing the need for armrests, the sitter supported by the generous sweep of the back rest around them. Through out the 1950’s low lounge chairs with out arms became popular a trend Wegner anticipated with the Venus Chair.